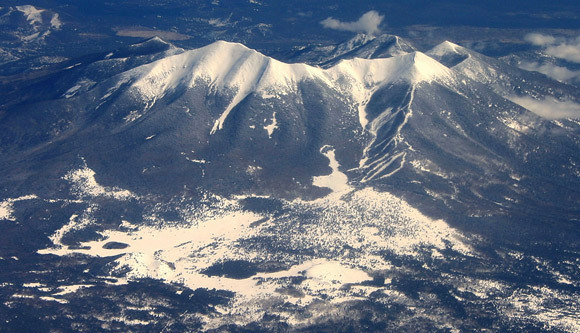 At 12,633 feet, Humphreys Peak is the highest mountain in Arizona. Photo © Matthew Jesperson. Where else are you able to ski and catch glimpses of the North Rim of the Grand Canyon at the same time? Groomed slopes at the Arizona Snow Bowl. Photo (cc) by Fred Camino. You’ll find the Arizona Snow Bowl high on the side of an extinct volcano in the San Francisco Peaks, 14 miles from Flagstaff, Arizona, and only 2 hours from Phoenix. Locals began skiing the area back in 1938 and it remains one of the oldest, continually operating ski resorts in the United States. The longest run is two miles and there are four chairlifts servicing 32 trails. The Arizona Snowball receives a remarkable 260 inches of yearly snowfall, features a vertical drop of 2,300 feet and 777 skiable acres. About 37% of the trails are beginner and 41% are intermediate, with the remainder created for very experienced and expert skiers. After the snow melts, the Scenic Sky Ride aboard the Agassiz lift remains open from Memorial Day to Labor Day, bringing visitors up the face of the mountain to an elevation of 11,500 feet. The Sky Ride provides excellent opportunities for photography, watching wildlife, hiking, or simply experiencing the relaxing ride up and down Arizona’s tallest mountains. Feeling energetic and adventurous? From the parking area at the base of the Scenic Sky Ride you can climb Humphreys Peak, Arizona’s highest mountain at 12,633 feet. The views from the summit are spectacular. Looking north you can view the North Rim of the Grand Canyon, to the east, the White Mountains and Holbrook, and to the south the desert mountains near Phoenix are visible. 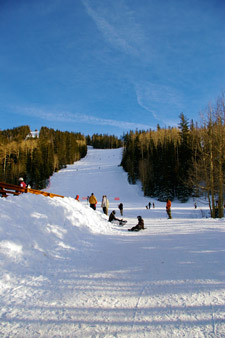 The Arizona Snow Bowl offers scenic slopes and 260 inches of annual snowfall. Photo (cc) by Sean Hobson. 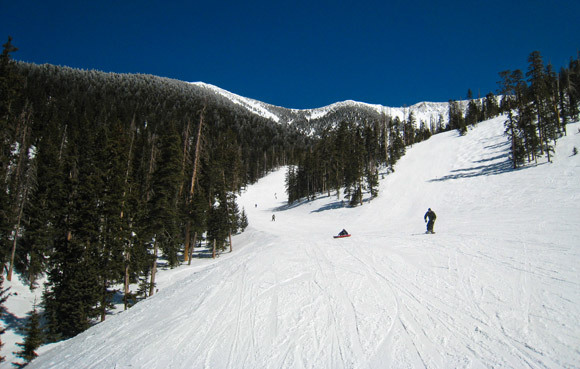 ACCESS: To get to the Arizona Snow Bowl and Scenic Sky Ride, travel seven miles north of Flagstaff on US 180 to the Snow Bowl Fort Valley Center, then go seven more miles to the lodge and the Scenic Sky Ride. 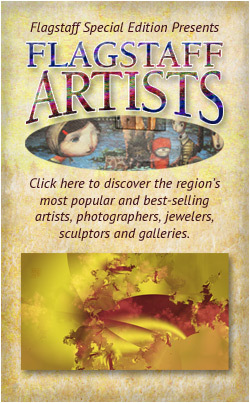 Flagstaff and Northern Arizona artists, photographers, jewelers, sculptors and galleries — display your art to collectors and buyers with a custom Gallery Page on Flagstaff Special Edition. Click for details.